Бьёрн Эйвинд Аартун и Оле Лиед (Норвегия) (Bjorn-Eivind Aartun, Ole Lied) за восхождение на Torre Egger (2850m), Аргентина. К сожалению, норвежец Бьёрн Эйвинд Аартун (Bjorn-Eivind Aartun) недавно погиб вместе со своим напарником Stein-Ivar Gravdal при попытке прохождения по ледовому маршруту на стену Kjerag (Lysefjord, юго-запад Норвегии). 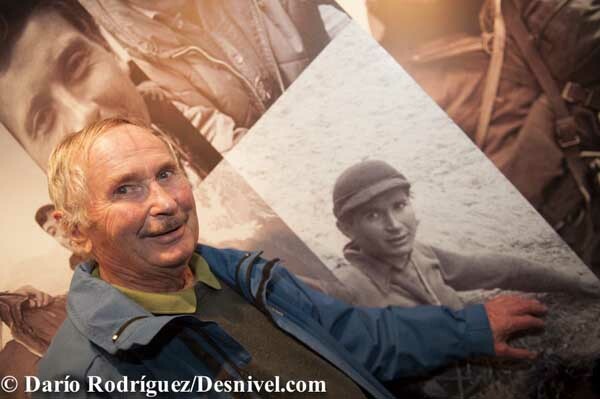 Премией "Piolet d’Or Lifetime Achievement - Walter Bonatti Award" (За достижения в течении жизни) был награжден один из величайших альпинистов Робер Параго (Robert Paragot). 21-00 - The Trento Film Festival at the Piolets d'Or (free entry). Альпинистские фильмы: Linea Continua, Herve Barmasse and Asgard Jamming, Favresse brothers. 16-30 - Пресс-конференция Робера Параго и номинантов (Jardin de l'Ange). 21-00 - Palanoir cinema – Церемония вручения 20-го Золотого Ледоруба. Награда Lifetime Achievement Piolet d'Or Вальтер Бонатти вручит Роберу Параго. Mark Richey, Steve Swenson and Freddy Wilkinson. Норвежцы Bjorn-Eivind Aartun и Ole Lied прошли впечатляющий ледовый маршрут, Venas Azules, по левой стороне южной стеныon the left side of the steep south face, overlooking the Col of Conquest. The pair first climbed 600m (6a and A1) of El Arca de los Vientos to the col, where they bivouacked. Next day, after an initial pitch of M5, they continued up very steep, ephemeral rime and blue ice plastered to the granite for six pitches to the summit. They then rappelled the face to their bivouac. Venas Azules has a total height gain of 950m, of which 350m were new at AI6 (95°) and M5. This is the first time the face above the col has been climbed since the original ascent by Americans in 1976. 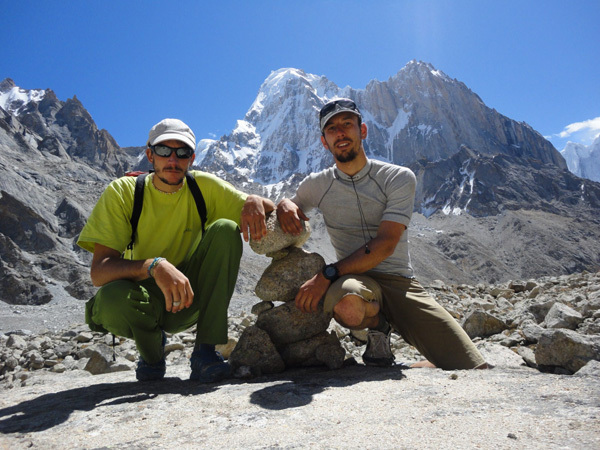 Kazakhs Gennadiy Durov and Denis Urubko climbed a new route on the North Face, right of the 1982 Dollar Route. The two completed the line, which had been eyed by Soviet mountaineers for nearly 30 years and which Urubko had dreamed of doing since 1993, in six days alpine style. They then descended the Normal Route to the west. The serious Dollar Rod (2,500m, but over 3,000m above base camp: Russian 6B: 6a M4/M5 WI2) was climbed in less than perfect weather. The technical difficulties were concentrated on three rock barriers but much of the upper section featured unprotected climbing. The route was awarded the 2011 Piolets d'Or Asia. Slovenians Nejc Marcic and Luka Strazar made the first ascent of the North West Face in a four-day round trip from their 4,200m base camp on the Charakusa Glacier. This is only the second route climbed to the summit, and was the third overall ascent of the mountain. The pair initially climbed steep ice runnels and mixed terrain left of the central spur to reach its crest, and after a difficult central section outflanked the headwall on the right. The route was named Dreamers of Golden Caves (1,600m: VI/5, M5 and A2) and came on their first visit to the Himalaya-Karakoram. 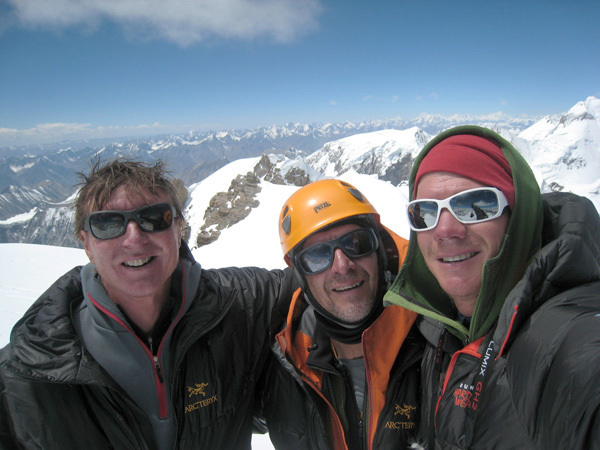 Americans Mark Richey, Steve Swenson and Freddie Wilkinson made the first ascent of the world's second highest unclimbed independent mountain (attempts on the highest, Gangkar Puensum in Bhutan, are currently banned). Saser Kangri II is also the second highest peak to receive its first ascent in true alpine-style. The three climbed the South West Face - The Old Breed (1,700m: WI4 and M3) - with three bivouacs, the crux close to 7,000m. They descended the route, with another bivouac, largely by rappel. In 2009 Richey and Swenson had attempted the same line, reaching 6,500m. Americans Conrad Anker, Jimmy Chin and Renan Ozturk completed one of the most attempted and most coveted lines in the entire Himalaya when they reached the summit of Meru Central via the 1,400m East Pillar a.k.a Shark's Fin. Since the first serious attempt in 1986, this compelling line had been tried well over 20 times by many of the world's foremost alpinists, including Anker twice before, and Chin and Ozturk once previously. The team climbed to the summit in 12 days capsule style with a portaledge, and took a further two days to descend the route. After an initial snow/ice face, the climbing involves hard free, mixed and aid to 6a, A4, WI5 and M6. Slovenians Ales Holc, Peter Juvan and Igor Kremser made the first ascent of the last remaining unclimbed 6,000m peak in the Xuelian Group via the West Ridge - Arete of Trust (2,400m: ED2 AI5 and M5+). After two full days and then two half days they reached the summit in deteriorating weather after an effective climbing time of just over 36 hours. The three then made a largely blind descent of the South East Face (2,000m: AI3 60-80°), forcing a route through poor weather for another one and a half days to reach the glacier. They also climbed three other previously virgin peaks up to 4,700m. К настоящему моменту отобрано более 80 самых разных восхождений в разных районах мира. Все они признаны представляющими интерес и вносящими существенный вклад в историю альпинизма. Затем этот список будет сокращен выборкой 20-25 восхождений, которые лучше всего выражают суть и дух награды Piolet D'Or. И, наконец, уважаемое жюри из 6 человек выберет из этого списка 6 номинантов. Председателем ж.ри в этом году станет Michael Kennedy - знаменитый американский альпинист и редактор журнала. Он известен своими восхождениями Infinite Spur on Foraker, Wall of Shadows on Hunter's North Buttress и the North East Face of Ama Dablam зимой. Долгое время был редактором Climbing Magazine, а теперь главный редактор журнала Alpinist. В жюри также вошли: Валерий Бабанов, Инес Паперт, Алберто Инуратеги, Liu Yong (a.k.a. Daliu, китайский гид из Ченгду), и Алессандро Филиппини, журналист итальянских Tuttosport и Gazzetta dello Sport. Начиная с 2009 года, во время церемонии вручается также специальный приз за огромный вклад в альпинизм в течение всей жизни. Первым награды был удостоен Вальтер Бонатти, затем Месснер, а в 2011 Дуг Скотт. В этом году награда предназначена Роберу Параго. - знаменитая экспедиция на Западное ребро Макаклу (ребро Параго), которая стала революционной в плане соединения технически сложного и высотного альпинизма. Конкурс был основан 20 лет назад, но основные принципы и дух остались прежние. Первыми лауреатами в 1992 стали Marko Prezelj и Andrej Stremfelj за свое восхождение в альпийском стиле по южному ребру Канченджанги Южной. 2. Mont Blanc (4 810m) Left Pillar of Brouillard. La Classica Moderna (350m on pillar; ca 1,000m to summit of Mont Blanc: 6c). Herve Barmasse, Eneko and Iker Pou. 3. Grand Capucin (3 838m) Nicolas Potard linked Lecco (Guerrino Cariboni, Casimiro Ferrari, Carlo Mauri, Aldo Anghileri, Pino Negri, 1968), and De fil en aiguille, via two new pitches (6a and 7a+). The climb, named Le Tresor de Romain, offers one pitch of 8a and one of 8a+. 4. La Vierge (3 306m) New route by Paul Dudas and Nicolas Potard: Ciao Vinc, 4c, 7a, 6b, 7b (a wonderfull crack), 7a, 7b+ and 6b. 7. Matterhorn (4 478m) Robert Jasper and Roger Schaeli made the second overall and first free ascent of Sebastien Gay on the north face. This is a difficult 400m start to join the classic Schmid route. The latter is then followed until roughly level with the Shoulder, where an exit is made left onto the upper Hornli Ridge. Jasper and Schaeli climbed the route at an estimated M8. 10. Olan (3 564m) North West Face. New route. Chauve qui peut (1,100m, 7b or 6c+ and A1). Mathieu Detrie and Pierre Labbre. 11. Presolana (2 521m) North West Face. New route. Piantobaldo (600 m, WI4, M7, A1). One day winter ascent. Tito Arosio, Yuri Parimbelli and Ennio Spiranelli. 12. Mahren. New Route. Infinite Jest (640m: 8a+/8b, 7b obl) on Mahren. Fourteen days spread over four years culminating in one-day red point. Matteo Della Bordella and Fabio Palma. Spaced bolting. 14. Triglav (2 864m) North Face. New summer rock route. Ulina smer (1,000 m: 7c). Tina Di Batista and Tomaz Jakofcic. One bivouac. 28 pitches; 25 bolts placed. 15.Civetta (3 220m) North West Face. First winter solo ascent of Via dei Cinque di Valmadrera (1,350m: VI+ and A3). Fabio Valsechini with eight bivouacs. First ascent in winter 1972 by Rusconi Brothers. 16.Cima Ovest di Lavaredo (2 973m) North Face. First winter ascent of Pressknodel (400m: 7c) by Simon Gietl and Roger Schali. Rappelled route. 17.Piz Ciavazes (2 831m) East Face. New route Das Privileg (300m: nine pitches: 7b) climbed with trad protection (nuts and pegs) by Simon Gietl and Simon Niederbacher. 18. Lastia de Gardas Two new routes: In mezzo poco (400m: 8a+) and Gracias a la vida (270m: 8a+). Largely trad protection with just a few bolts. Pietro Dal Pra and Alessandro Rudatis. 19. Marmolada (3 342m)South Face. New route (Bruderliebe, 800 m: 8b/8b+). Hansjorg Auer belayed by brother Vitus Auer. 20. Tofana di Rozes (3 245m) South Face. New Route Viki krema (800m: 7a/7b). Tomaz Jakofcic and Luka Lindic. Climbed over four day period, then freed over two days. Mostly trad with 23 bolts placed. 21. Trilogy of the north faces of Grandes Jorasses, Eiger and Matterhorn From January 14 - March 12 Patrice Glairon-Rappaz and Cedric Perillat Merceroz climbed the north faces of Grandes Jorasses, Eiger and Matterhorn by three difficult direct routes. 22. St John’s HeadFirst free ascent of Long Hope Route Direct (ca 490m of climbing: British E11 7a; 8b+ on trad gear) by Dave McLeod (with Andy Turner). New Ice falls. Frozen Bones (250m: WI6, X/R), Stalker (700m: WI6/M7) and Remember Mi (WI7- M8) by Albert Leichtfried, and Benedikt Purner. Febris (350m: 7c) Andreas Klarstrom and Martin Olslund. First route on Blammanen climbed without a hammer. Arctandria (450m: 8a+) Eric Grandelius, Olslund and Karstrom. Third free ascent and climbed through the "night" after work. These boys are young. Olslund is 18. New route. The Shining (15 pitches: seven sustained pitches on headwall: 5.13c/d). Established from ground up and bolted on lead. Tommy Caldwell and Sonnie Trotter. Hallucinogen Wall. First Free ascent (5.13+/R) by Hansjorg Auer. 30.Kahiltna Peaks West (3 914m) East Spur. First Ascent (1,800m: 70/80°, Mixed, and 5.6). Diego Giovannini and Fabio Meraldi. 31.Mt Hunter (4 442m) North Buttress. Partial new route. The Cartwright Connection 1,200m to Cornice Bivouac. ca 600m-700m of new climbing (M6 AI6 5.8 A2). Jon Bracey and Matt Helliker. Six days. North East Face Direct. First Ascent 1,000m TD+. Descent of North Ridge in 22 hour continuous push. Neil Warren and Guy Wilson. West Face. First ascent (1,400m: WI5). Clint Helander and Scotty Vincik. Two days. 35. University Peak (4 341m). South West Spur and South West Ridge. New Route. 2,550m. Six days. AI3/4 with a few rock steps but highly committing. Kevin Ditzler and John Kelley, who descended north on 1955 Route with one more bivouac, then had to wait in a glacier basin for five days with minimal food for pick-up. Tom Holzhauser, Toni Lamprecht, Andres Lieth, Caroline Morel, MIchi Tresch and Michi Wyser climbed 10 new rock routes from 300m to 800m (18 pitches) and from 6a+ to 7b, including Serratit on Asiaq (600m: 12 pitches from 6b+ to 7b) by Holzhauser, Lamprecht and Tresch. All routes climbed clean, on-sight and without fixed gear. First ascent. Considered one of the highest and most technical unclimbed peaks in the range and had resisted many attempts since the first in 1944. North Face (70° and 5.9) but terrible rock. Only summit ridge difficult. Fernando Fainberg and Waldo Farias. First winter ascent. 14 August in 22 hours from high camp. Maria Paz Iberra and Camilo Rada. Eight pitches above the rimaye with ice to 90°. Variant to Garibotti-Sourzac Route (450m of climbing to WI5) on South Face. Third overall ascent of peak. 40.Aconcagua (6 962m) Andrea di Donato and Andres Zeger made an alpine-style ascent of the 1985 French route on the south face, making a variant to the right of the orginal route on the first rock band. The pair completed the ascent of the 2,800m face in 50 hours with two bivouacs at WI4 70° and UIAA V.
East Face (couloir) and North Ridge. New route Jardines Japoneses, (650m: AI4, M5, 5.10, A1) by Jens Holsten, Colin Haley and Mike Schaefer. South Face. New route. Washington Route (12 pitches plus simul-climbing: 5.10 and A1) right of the Californian Route by Kate Rutherford and Mike Schaefer. East Pillar, First Free Ascent via a combination of Ferrari Route and El Corazon (1,350m of climbing: 7b on sight). 27? hours. Nico Favresse and Sean Villanueva. Rappel descent of Royal Flush. Whit Magro, Nate Opp and Josh Warton linked Aguja Desmochada, Aguja de la Silla and Fitz Roy to produce The Wave Effect (1,900m of which ca 800m new: 7b+). Four days alpine style including a new route on Silla. 47. [Also Golden Eagle first free ascent (700m: 7a+) by Raoul Martinez (who on-sighted the crux), Cintia Persivati and Sean Villanueva. South Face. El Caracol (500m: 5.9 A1+ M4) by Jorge Ackerman and Colin Haley. Completes the 1977 Brian Hall - John Whittle climb, which stopped at the overhanging summit cornice. South Face. New route above Col of Conquest (reached via El Arco de los Vientos) by Bjorn-Eivind Aartun and Ole Lied. 950m (of which 350m new), 6a, A1, AI6 (95°), M5. Alpine style in two days with bivouac on col.
Chichiacapac South Face first ascent. Apparently the plum of this little visited range. 600m, TD, Scottish 6, with some objective danger, poor rock and protection. Hamish Dunn and Tom Ripley. Descent by West Ridge, one-day round trip from camp. Santa Cruz Chico (5,800m). East Face. Second ascent of face via new route joining Scottish Direct route at top. 450-500m ice to 90°. West Face. New Route - Quantum of Solace (600m: 14 pitches: WI7+ and M7) by Ines Papert and Wolfgang Russegger. First ascent of South East Ridge Integral and traverse of mountain. North face. New Route - Dollar Rod (2,500m: Russian 6B: 5.9/5.10 M5) by Gennadiy Durov and Denis Urubko in six days alpine style. All-women first ascent of North West Ridge and descent of West Ridge. Second ascent of mountain. 1,500m alpine style. Seven-day round trip. Christine Byrch and Pat Deavoll. First winter ascent, by Simone Moro, Cory Richards and Denis Urubko via Normal Route. North West Face, first ascent by Nejc Marcic and Luka Strazar. Dreamers of Golden Caves (1,600m: VI/5, M5 and A2). Four days round trip from base camp. First ascent via West Face (WI5 and M5) by Kyle Dempster and Hayden Kennedy. North West Face. New Route. No Fear (900m: 6b+ and A3). Dmitry Golovchenko, Sergey Nilov, Viktor Volodin and Alexander Yurkin. Ten days capsule style with three camps. North West Face. New Route. Parallel World (2,580m of climbing. 49 pitches. Russian 6B: A3). Three days fixing, then 32 days to summit in capsule style. Three days to descend. Galina Chibitik, Marina Kopteva and Anna Yasinskaya. West Face, two new routes. Sigurd Felde, Henki Flatlandsmo, Ole Ivar Lied and Odd Roar Wiik completed the line previous tried by Germans (900: 22 pitches: A2/A3) in 20 days. Jarle Kalland and Sindre Saether spent six days climbing a route to the right (900m: 20 pitches: 5.11d and A2). All-women Alpine style ascent of Diamir Face to South West Ridge at ca 7,600m via a line based on 1978 Messner Descent Route, plus some new ground. Not to summit. 3,100m, 70°, serious objective danger in lower section. Eight bivouacs total on ascent and descent. Irena Mrak and Mojca Svajger. First Ascent via previously attempted South West Face (1,400m: WI4, M6) by Doug Chabot, Bruce Miller and Steve Su in two days alpine style (plus a third for the descent). First Ascent. Second highest virgin mountain in the world and second highest peak to have its first ascent in true alpine-style. South West Face - The Old Breed (1,700m: WI4 and M3). Mark Richey, Steve Swenson and Freddie Wilkinson. New Route. East Pillar - The Shark's Fin. 1,400m. Difficult mixed free and aid climbing (A4). Conrad Anker, Jimmy Chin and Renan Ozturk in 12 days capsule/alpine with portaledge, then two days for the descent. White Sapphire. First Ascent. West Face - La Viree des Contemporains (850m, WI5 with two crux pitches of WI6, M6 and A2). Denis Burdet and Stephan Siegrist. Cerro Kishtwar. Second overall ascent. New Route. West Face and South Ridge - Yoniverse (1,200m, WI5 6a). Denis Burdet Robert Frost, David Lama and Stephan Siegrist. First ascent in Kinnaur region via Trishul Direct (700m: 19 pitches: 7b), completed by Yannick Boissenot and Giovanni Quirici. Started route with Elie Chevieux. Camped at foot of wall for 10 days but only four days of good weather. Worked route to high on the facel before returning to camp and eventually redpointing to top. 39 bolts placed. North Face. First ascent and most likely first calandar winter ascent of peak by Andy Parkin, solo. Two bivouacs on face. Excellent climbing to 85°. First ascent via ca 1,100m West Face (ED) by Mick Fowler and Dave Turnbull in four days. Then north east along frontier ridge and over unclimbed Pt 6,264m, and down west flank. Eight bivouacs total. First ascent by West Ridge (2,400m: ED2 AI5 and M5+) - Arete of Trust - by Ales Holc, Peter Juvan and Igor Kremser. Descent by South East Face (2,000m: AI3 60-80°). North West Face. New Route - Ni Hen Piao Liang (1,300m: 5 M6) to right of Fowler-Ramsden Inside Line and Russian routes. Mael Baguet and Dimitri Messina. Five days round trip. Descent by North Ridge. South Face - new route. Variants to the line attempted by Philippe Batoux et al in 2006. Sun Bin and party. Alpine-style. More information to come. East Face first ascent - Ame ni mo Makezu (1,900m: 21 pitches: ED1 WI4 M5R). Alpine-style. Fumitaka Ichimura, Ryo Masumoto, and Takaaki Nagato. Two bivouacs on face; four-day round trip from camp. Also Reddomain (6 112m). North Face, first ascent. Remember Chris (1 000m, AI2 55° snow) by Yan and Zhou, and Xiao Gongga (Little Konka, 5,928m) south face, new route Thrill (600m: M6 50°) by same pair with Li Shuang. First ascent of North West Face of Pt 7,570m (right of Cadiach-Ruckensteiner North Ridge). Traverse to Camp 2 on Normal Route and then down. ca 1,100m, 55° snow and UIAA III rock. Climbed solo by Jordi Tosas 8pm to around 6am. Ueli Steck soloed a combination of routes on the right part of the south face to make a rapid 10.5-hour ascent to main summit. First traverse. New route South West Ridge up - North West Flank down. Kazuya Hiraide and Kei Taniguchi. Five bivouacs -alpine style. Abandoned original plan of South East Face as too dangerous.